This is portable and fashionable cell phone sleeve case with delicate design,using a single magnetic buckle design,it is convenient for you to take out the things in your phone sleeve.Slim and lightweight no bulky feeling when holding it,fashionable and elegant looking,easy to carry.,offers a good protection in daily use,protect your devices from crashing, scratches, dirt and grime.It's slim and lightweight,and can easily slide into your briefcase, handbag or backpack,so it's easy to carry to wherever you go.In a word,it's a wonderful gift for your friends and family members. 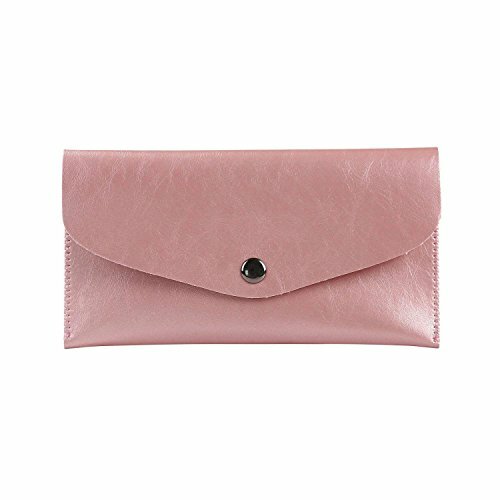 High Quality Durable Material:The phone wallet style sleeve cover is made of the soft-touching PU leather.Touch more soft and comfortable,offers a good protection in daily use. Large Enough Storage Space:Fits the smart phone up to 5.5 inch(without thick phone case) and has extra space for credit card, ID, cash, coins,mobile earphone.Two slots are good for separating your credit card or mobile earphone line from your phone. Portable and Fashionable Design:Using a single magnetic buckle design,it is convenient for you to take out the things in your phone sleeve.Slim and lightweight no bulky feeling when holding it,fashionable and elegant looking,easy to carry. Widely Applicable:Great fit for iPhone X,iPhone 8/7 Plus,iPhone 8/7/6/6s/5s,Samsung Galaxy S9/S8/S8+/S7/S7 Edge/S6/S6 Edge/S5,Note 5/Note4, J3,J7/J7 Prime 2,Moto G4/Moto Z/Z Play/Z Force,LG G5/LG X Power,HTC One X and other Smartphones up to 5.5 inch. Delicate Gift:A wonderful gift for your friends and family members.Not only for putting cell phone, also can be used as a wallet or something like a cosmetic mirror sleeve bag,It can easily slide into your briefcase, handbag or backpack,so it's easy to carry to wherever you go. If you have any questions about this product by Ailzos, contact us by completing and submitting the form below. If you are looking for a specif part number, please include it with your message.